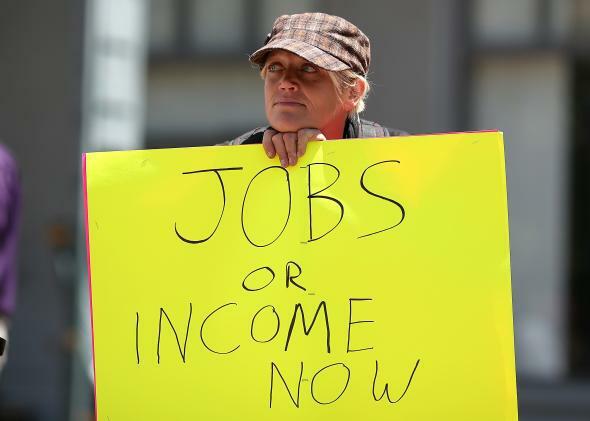 A demonstration against cuts in unemployment benefits, Oakland, Calif., July 11, 2012. Today I posted an analysis of Obama’s State of the Union. You can read it here if you like. The takeaway is that Obama talked a lot more about rewarding “work” than about rectifying “inequality.” The free market and the work ethic don’t always overlap. In recent years, we’ve seen growth without much payoff for workers. Obama is converting that gap into a wedge issue. Where did this tactical shift come from? And why now? Nearly two months ago, Obama talked about many of the same issues in a speech at the Center for American Progress. He spoke just as passionately about rewarding work. But he also talked about inequality. That’s the word that disappeared from the State of the Union. In the CAP speech, Obama used the word inequality more than 30 times. In the State of the Union, he used it only three times. On the left, inequality has always been a fundamental concern. My friend Tim Noah wrote a terrific series on it in Slate, and an even better book about it. (For a different take, see another great book—this one’s by the excellent Mickey Kaus, who represented the right wing of Slate, such as it was, before that title fell, even more preposterously, to me.) Obama’s extensive remarks on this subject at CAP show that he shares this concern. But they also reflect his worries about the politics of the word. If we’re going to take on growing inequality and try to improve upward mobility for all people, we’ve got to move beyond the false notion that this is an issue exclusively of minority concern. And we have to reject a politics that suggests any effort to address it in a meaningful way somehow pits the interests of a deserving middle class against those of an undeserving poor in search of handouts. That’s a pretty shrewd analysis of why inequality is hard to talk about. A lot of people think that if you try to equalize wealth, you’ll wreck the economy. And a lot of them think you’re talking about handouts for slackers. And there, I suspect, is the solution to the mystery of what happened to the word inequality. In the CAP speech, Obama was explaining to liberals why it’s a hard word to talk about. In the State of the Union, addressing the public as a whole, he took his own advice. He dropped the word, and he replaced it with the language of work.